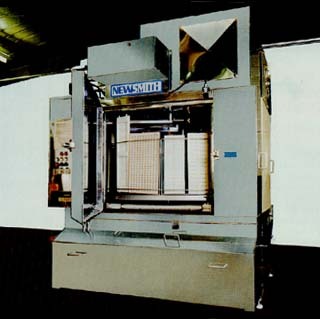 Newsmith Stainless, Ltd. manufactures all stainless steel batch or inline industrial washing machines. Sizes ranging from lab  size units to full size units with outputs up to 3,000 trays per hour. Units can be supplied to wash chocolate molds, trays, pallets, tubs, bins, and utensils perhaps with the same unit. Features available include 100% drying, prerinse section on some models, mold cooling station, and several others depending on the model of washer.